The formal name of the tea in Hindi is masala (spiced) chai (tea*, from the Mandarin cha). It originated on the Indian subcontinent. Americans shortened the term, and chai (CHY) it is. Its spices have been ported to sweets: bonbons, bread pudding, cake and cheesecake, cookies, fudge, marshmallows, muffins; in cocktails; in glazes for chicken and ham; and as a liquid for cooking oatmeal and rice pudding (check out these recipes). Chai is black tea flavored with aromatic spices and herbs. The recipe is not fixed: Each vendor or home cook picks a proportion and ingredients to taste. The “givens” are black tea, ginger, green cardamom pods, milk and sugar. Other popular spice additions include allspice, black peppercorns, cinnamon sticks, cloves, nutmeg, even vanilla and star anise. While the conventional base is black tea, there are green tea versions. You can also brew your own chai from scratch, with this recipe. Chai contains the caffeine of its black tea; a cup typically has one-third the caffeine of coffee. There are numerous chai options on store shelves: tea bags, loose leaf tea, instant powdered mixtures and syrups. Our current favorite is the concentrate from Oregon Chai because of its flexibility. The concentrate has no milk, allowing choice of fat percentage, lactose-free and plant-based milks. There are sugar-free and caffeine-free options. As someone who likes calorie-free sweeteners and lactose-free milk, we needed to look no farther…although we’d love an slightly sweet Sugar Free version with less sucralose. The hack is to change the proportions from 1:1 concentrate to milk to 1/3 concentrate and 2/3 milk. The line is Non-GMO Verified, USDA Certified Organic and Certified Kosher by OU. The products are shelf-stable, to be refrigerated after opening. Simply open the container and mix equal parts of concentrate and milk. Then, heat it in the microwave or pour it over ice. For more information visit OregonChai.com. Invite friends over for a chai tea party (photo courtesy Charles Chocolates). With Oregon Chai, it’s a snap. 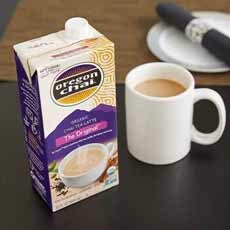 Just mix the concentrate with your milk of choice and heat in the microwave (photo courtesy Oregon Chai). 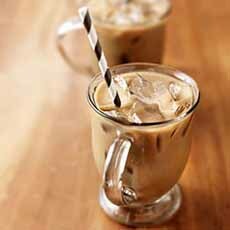 Iced chai (photo courtesy Oregon Chai). 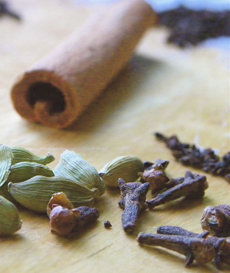 Some of the chai tea spices: cinnamon, black peppercorns, cloves and green cardamom (photo courtesy 30 Minute Dinner Party). Today’s masala chai is a relatively recent creation. 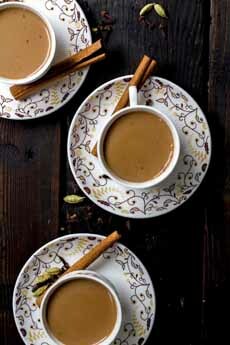 The original masala chai is very different from the contemporary recipe. That first version was an ancient Indian ayurvedic beverage—a cleansing spice tonic that did not include any tea (Camellia sinensis). When the British began to establish tea plantations in Assam, in 1835, they added milk and sugar to their tea, as they did at home. At the time, tea was too expensive for most Indians and was largely grown for export (this is unfortunately true of other third-world crops, including coffee). In the early 1900s, the British-owned Indian Tea Association began to promote tea consumption to Indian consumers. Because black tea was still an expensive ingredient, vendors used milk, sugar and spices—the ingredients of today’s masala chai—to create a flavorful drink while keeping costs down. The drink’s popularity spread throughout India and became even more popular in the 1960s, when mechanized tea production made black tea affordable for the common man. After water, tea is the most widely consumed beverage in the world. Coffee takes third place. *The English word, tea, though, comes from the Hokkien Chinese tê.